Both new instructors teaching media ethics for the first time and mature faculty -- who recognize that media ethics instruction deserves more than being worked into the professional classes -- find most of their instructional techniques come from observing their own instructors or from hunches. The literature of media ethics appears to be long on principle and reasoning but short on how to transmit that body of wisdom to students already dazed by an assault on their right/wrong world. Accordingly, this special issue is aimed at providing some correction to the problem by presenting a few ideas to help instructors, whether they labor in the classroom or in the newsroom. Volume 12, Number 4, 1997 Contents: Foreword. 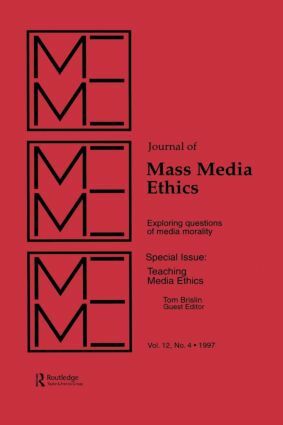 S. Baker, Applying Kidders' Ethical Decision-Making Checklist to Mass Media Ethics. D. Birkhead, Should Professional Competence Be Taught as Ethical? T. Brislin, Case Studies by Numbers: Journalism Ethics Learning. S.L. Yoder, G.L. Bleske, The Media Ethics Classroom and Learning to Minimize Harm. CASES AND COMMENTARIES:Teaching "A Professor's Moral Obligations."